Call, text or email us to schedule a free estimate on any service! ​Since 1986, Bell Electric LLC has been a leading provider of residential and commercial electrical construction and repair services to its customers in the Atlanta metro area. We pride ourselves on being a family-owned business. Bell Electric was founded in 1986 by Michael Bell, an Army veteran, Georgia native and licensed electrician with years of experience. 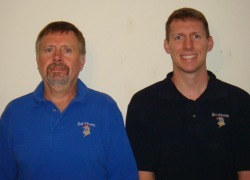 Mike’s son, Jason, began working for the company part-time during high school and college. After serving our country in the Air Force, Jason returned to work for Bell Electric, obtained his electrical license and later took over ownership of the company. Both Mike and Jason have carried on the values they learned while serving our country, and both are involved hands-on in each project, from start to finish. Bell Electric LLC has established a reputation of integrity and honesty in its business practices. Our goal on every project is to insure safety, quality, and thorough work through constant communication between homeowner, designers, builders, and any other partner in the project. We believe that quality work speaks for itself and that pricing should be fair for the work that was provided.